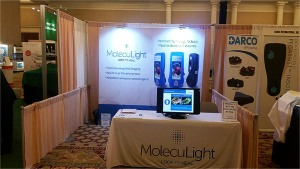 This was MolecuLight’s first time exhibiting at the SAWC (Society of Advanced Wound Care) Fall Conference (September 26-28 2015) to over 1000 wound care professionals. Attendees learned about how MolecuLight’s handheld real-time imaging device allows for detection and visualization of clinically relevant bacteria in wounds. A poster entitled: Fluorescence image-guidance improves wound sampling and bacterial load detection in diabetic foot ulcers: a clinical study, was also presented with the latest clinical findings.